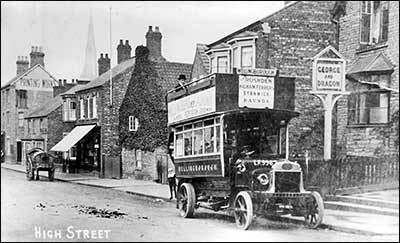 All Aboard For Rushden - Fifty years ago the only means of transport from Irthlingborough station to Rushden was by this horse drawn 'bus' which ran a service several times a day, finishing its run at the Wheatsheaf Inn, where the horses were stabled. For many years Mr. F. Jeeves was the driver until he moved to Cambridge, where he died last week. Looking with interest at the photographer was Master G. S. Gill, son of the stationmaster. 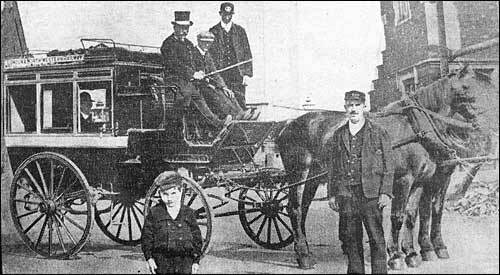 Mr. Gill was the postmaster at Rushden, having recently retired. 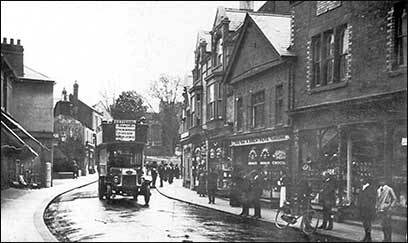 The picture belongs to Mr. C. H. Jeeves, of 54, Wymington Road, Rushden, son of the late Mr. F. Jeeves. Extract from our Memorial page to P Jeeves: The deceased soldier was the son of Mr. Jeeves, who formerly drove the L. and N.W. Railway omnibus from the “Wheatsheaf” to the Irthlingborough old station. A SHOCK was experienced by passengers in a double-deck omnibus on the Irchester road on Saturday night when the front axle snapped. The 'bus was going downhill, but at a slow pace, having just picked up some passengers, and the vehicle remained upright. When it stopped it was found that nobody had suffered anything worse than a shaking.